Smart Home Tablet and on Google Play™ or iTunes®. 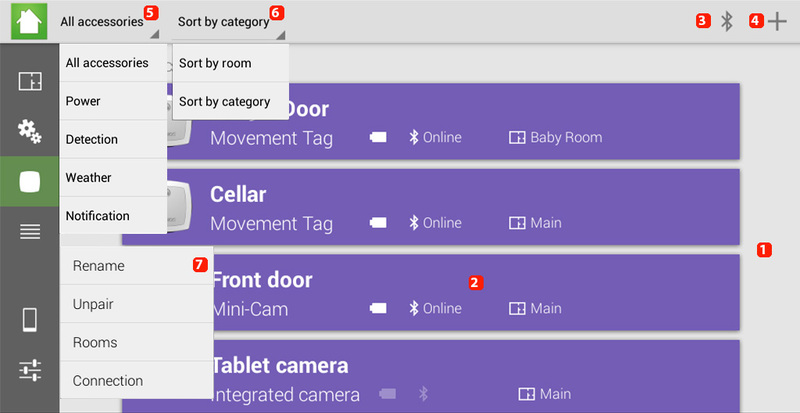 You can manage your connected objects from a distance. For more detailed information, please consult the device's Quick Start Guide or the corresponding FAQs. From the Rooms tab, you can manage the accessories location and access quickly the data they send to the tablet. 1. It displays in which room you are. 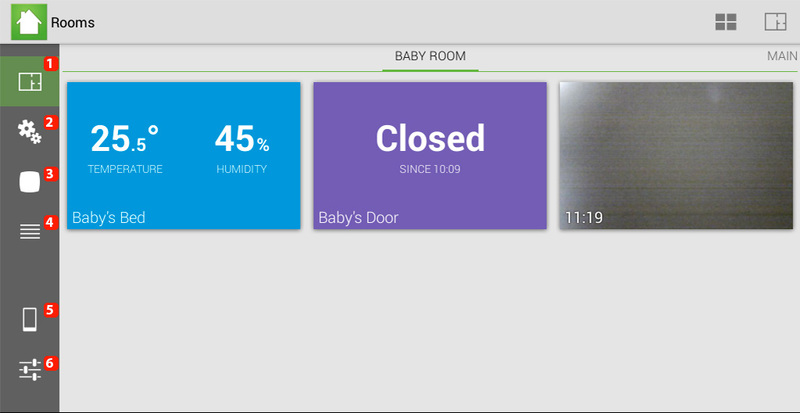 If you have created many rooms, slide the displayed room left/right to display them. 2. It allows to reorganize the items the way you waant. You can add/move or delete information. 3. It allows to add/modify/delete a room. 4. Blocks of information and each block corresponds to an accessory. Select a block to display detailed information. 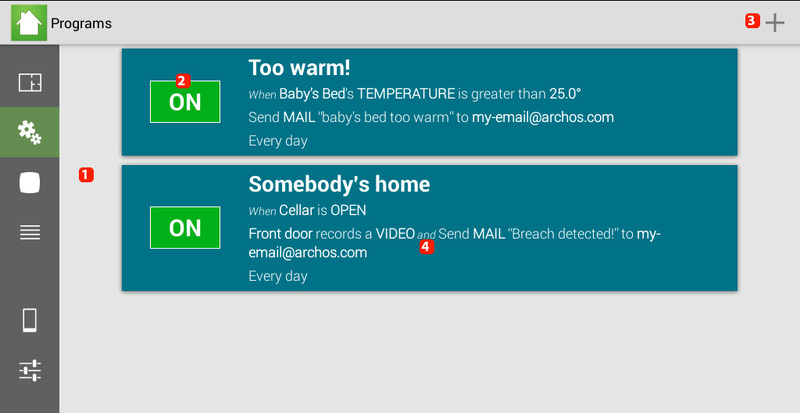 Programs are scenarios that you create for interactions between one and many accessories (for example: If the temperature outside is below 0° C, you tablet sends you an email). 2. It indicates if the program is activated or deactivated. Press to turn on/off. 3. It allows to create a new program. 4. Select a program to modify/delete it. Holding your finger on a program allows you also to start modify/delete/duplicate it. 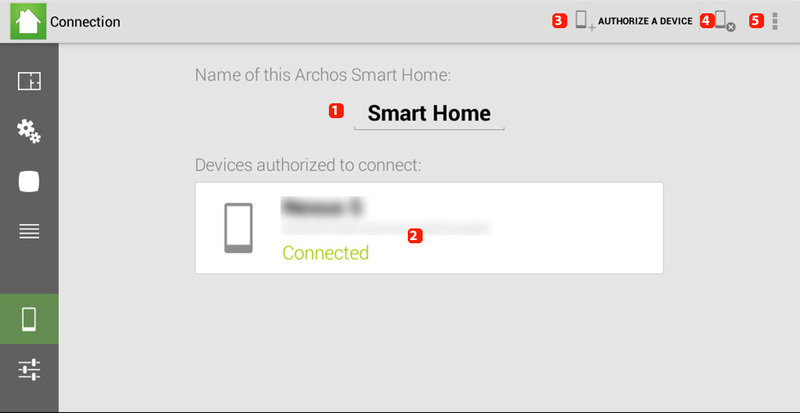 From this tab, you can link a compatible device to your ARCHOS Smart Home Tablet so that you can manage it from a distance. 1. Name of the tablet that will be displayed on your device. You can modify it. 2. Name and information about the devices linked to your tablet. 3. You can add a new device. 4. It allows to delete devices linked to the tablet. 5. It allows to display informations provided by the application. How to configure voice commands? Why my device doesn't carry out my commands? What are the different meanings of the LED? Can I say voice commands when the screen is turned off? How to configure the screen saver? How to configure the video surveillance app Cawice? Comment diffuser l'écran de mon ARCHOS Hello sur la télévision?